The Rainmaker, the result of ongoing development from Canada Fishing Reels for those who want a drag reel with a traditional look and feel. It comes complete with a fully rounded bronze rim, bronze handle pins, acrylic matching handles, brass drag lever, ABEC 7 bearings, and a dust plate in back of the spool face. The drag system is a "set and forget" style with drag tension adjusting screws in the spool cap. The drag system has both a winding clicker and an audible (outgoing) drag clicker. A bit of history on this reel is in order. My good friend Simon Wood has been a field tester during the development of the Canada Drifter drag reel. After many hours of fishing with the reel he declared it a winner. A while after that he told me that some day he wanted me to make him his "dream reel". He even had a name already picked out; Rainmaker. A while after that we set about discussing what it would be like.......and what it would be like is what you see below. We took the Canada Drifter drag system, made the reel a bit bigger in diameter for the "unique" factor, made the spool a bit narrower, totally redesigned the porting, and then added the bronze rim and accent pieces. The dark maroon brown was chosen to compliment the bronze pieces and the gold dust plate as a further accent. There is no doubt that Simon has an eye for what a great reel should look like. We hope you agree. 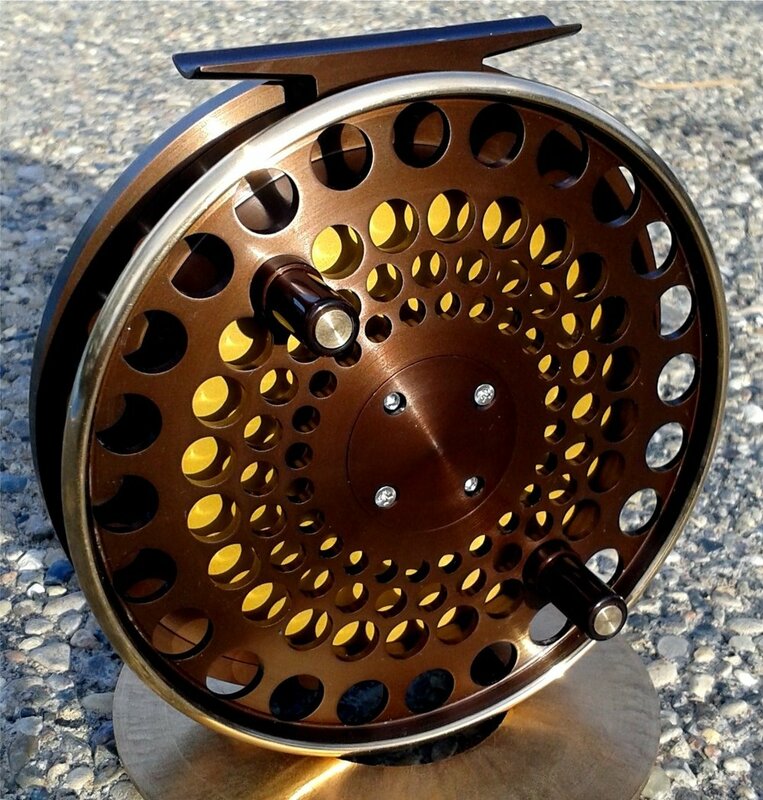 Reel Diameter: 4.62" or 5"
Colours: Dark maroon brown, black, dark pewter, forest green, royal blue, gold. Dust plates can be the same colour as the reel or a contrasting gold or silver to match the rim. The standard handles for the dark brown reel are dark pearl bronze as shown, other handle colours are used for complimenting the other reel colours. Note: This reel can also be ordered for persons who prefer right hand wind. The drag engagement lever location is on the opposite side so that it faces the back of the rod for easy access and the pawls in the drag mechanism are reversed so that they engage correctly for right wind operation. The reel can be converted back to left wind in our shop if desired. This is a special version of the Rainmaker, called the Rainmaker Custom. It has 6 rows of holes and a shallow spool of 1/4". We make only a few of them each year. The one in this picture has an optional drag knob, the reel is normally fitted with the flat spool cap. As it happens this one is right hand wind but like all our reels they are available in both LHW and RHW. The handles shown are very nice but we can no longer obtain the black/gold material. It is available in 4.6" and 5" in a variety of colours and the price for either size is $1400 Canadian, shipping extra and it comes with a black zippered leather pouch. There is an optional hand made leather case available.